8 1/2 x 11 Customized Rolled Scroll | Customized Scrolls | Scrolls Unlimited, Inc. 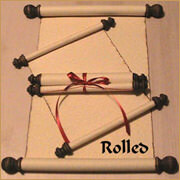 The 8 1/2 x 11 "Customized Rolled Scroll" is printed on a standard size sheet of paper. The scroll pictured here is an 8 1/2 x 11 rolled scroll with our Rolled Scroll Storage Box which is lined with brown suede material and a strip of leather to secure the scroll. Personalize the box with an engraved plate with name and date of special event. Box is all handmade and comes with felt dots on the bottom so it won't slide off or scratch a table top. * A CUSTOMIZED SCROLL COMES WITH TWO PROOFS. ADDITONAL PROOFS WILL COST $5.00 EACH.